Recently I decided to fork over $400 to US Bank in order to keep my Altitude Reserve Visa Infinite card for another year. I did this despite the fact that I have and plan to keep both the $450 Sapphire Reserve Visa Infinite card, and a $400 CNB Crystal Visa Infinite card. I keep the Sapphire Reserve card for its 3X rewards for travel & dining, and its best in class travel protections. Plus the card’s annual $300 in travel reimbursements makes the $450 annual fee much easier to rationalize. And I keep the CNB card because it offers a bunch of great perks as well as $250 in travel fee credits for my card and for each of my family’s 3 free authorized users cards (yes, we get $1,000 in travel fee reimbursements each year). For more about the CNB card, see: Crystal Visa Infinite: The best card you can’t get. The Altitude Reserve doesn’t have as much going for it as the Chase or CNB card, but you shouldn’t count it out. The card’s $400 fee is largely offset by $325 in annual travel fee credits. And, like the CNB card, it offers 12 free Gogo Wifi passes per year. The card’s best feature is that it offers 3X rewards for travel and mobile wallet payments (i.e. Apple Pay, Samsung Pay, etc.). And since each point is worth 1.5 cents towards travel, this card earns 4.5% in rewards for travel and mobile wallet payments. I don’t usually use the Altitude card to pay for travel. The Sapphire Reserve offers the same multiple for travel (3X), but it also offers much better trip protection. And Chase’s Ultimate Rewards points are more flexible. Like Altitude Reserve points, Ultimate Rewards points can be used for 1.5 cents each towards travel. Unlike the Altitude Reserve, Ultimate Rewards points can be transferred to a hotel or airline partner where it is often possible to get much more value. 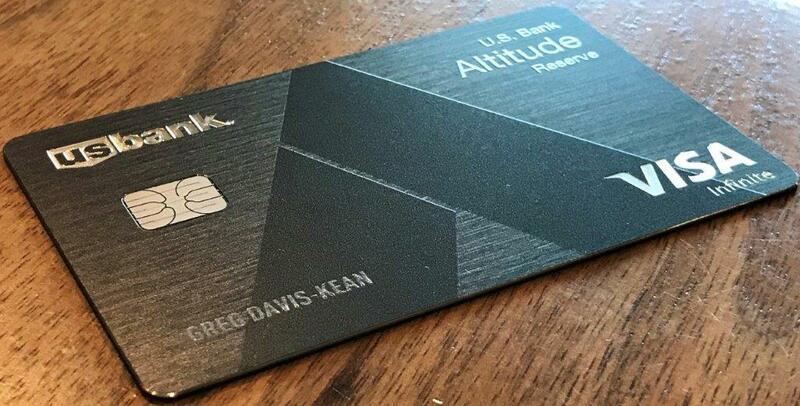 I do use the Altitude Reserve for mobile wallet payments to earn 3X rewards, but in the previous 12 months I didn’t use that feature nearly often enough to justify the net $75 annual fee ($400 minus $325 in travel credits). If you consider that I usually use Apple Pay in places where I’d otherwise earn 1.5 points per dollar with my Freedom Unlimited card, it’s easy to see that the Altitude Reserve, when used with Apple Pay, offers 1.5 points per dollar more than I would have otherwise earned. And, since points are worth 1.5 cents each towards travel, I essentially earn 1.5 x 1.5 = 2.25 cents per dollar extra with the Altitude / Apple Pay combination. To justify the card’s net $75 annual fee, I would have to spend $75 / $0.0225 = $3,333.3 just to break even. And I’d have to use Apple Pay much more than that to make it seem like a deal to keep the card. So, when adding up the costs and benefits of the card I made the rational decision to cancel it when the annual fee came due. Ever since I discovered how much better it is to use Apple Pay rather than a credit card in Europe, I’ve made a habit of using it as often as possible when I travel (see: A simple Chip & PIN solution for US tourists). That helped increase my Altitude Reserve 3X earnings. Then, more recently I discovered that the veterinary office we take our dog and two cats to accepts Apple Pay. The veterinarians clearly want me to keep my Altitude card, so they help out by charging big bucks. With dental work and other treatments on the horizon, my Altitude card may just pay for itself after all. And then came Real Time Mobile Rewards. Or, more specifically, then came the ability to get 1.5 cents value for travel purchases with real time mobile rewards. Once you opt in to this feature and make a qualifying purchase, you get a text message asking if you’d like to redeem points to cover that purchase. When you do so, US Bank removes the given number of points from your rewards account and credits the appropriate dollar amount to your statement. You can use this feature to pay with points for travel purchases, including Lyft, Uber, and even Uber Eats (food delivery service). My Lyft ride cost $39.38. By paying with my Altitude Reserve card which was enrolled in Real-Time Mobile Rewards, I was able to wipe out that charge in exchange for only 2,625 points. I love this feature! Where else can you get Uber and Lyft rides for free with points at 1.5 cents per point value? Even better, these charges also qualify for the card’s annual travel reimbursements. It’s also worth noting that this feature works with the purchase authorization amount rather than the final processed amount. This is meaningful because sometimes you can redeem more rewards at 1.5 cents each than you actually ended up paying. For example, hotels routinely pre-authorize extra to cover potential in-room charges. You can use points to reimburse the entire pre-authorized amount rather than the final check-out amount. Real-Time Mobile Rewards isn’t perfect. In most cases, your purchase must be at least $10, so you can’t use this feature with very cheap Uber rides. Worse, the minimum purchase amount for car rentals is $250, and $500 for hotels. Plus, the feature only works with US merchants (except occasionally when it works with others). The worst part is that it’s completely unclear when it will or won’t work. To help with that, please see: US Bank Real-Time Mobile Rewards. What works where? Still, despite all the caveats, I love being able to wipe out certain travel purchases with this feature. It’s unlikely that I’ll earn enough extra rewards with the Altitude card to make it a good deal to keep the card. To consider it a good deal, I’d have to come out ahead by much more than the card’s net annual fee. At best, though, I’m likely to break even. But, we’re not talking big bucks here. I’ll easily earn the card’s $325 in travel credits, so my net cost is closer to $75 before considering the extra rewards earned via Apple Pay. For whatever reason, I’m enamored with Real-Time Mobile Rewards. If Chase decides to mimic this feature then I’ll say goodbye to the Altitude card. But, for now, I’m OK with making a financially irrational decision when the stakes are low in exchange for the Joy of Free. And in my post “Rationality is overrated,” I explained that it’s often OK to make poor financial decisions in exchange for joy. I concluded, “if your finances are sound, maybe its OK to follow your heart even if your wallet complains.” With the Altitude Reserve, I’m following my own advice. I assume you know that you can easily obtain a 10,000 point retention bonus by calling and mentioning you are thinking about canceling your card. Still new to Real Time Rewards — I have my FlexPerks Travel Rewards Visa with only 1000 points left. I’ll get the 3500 points for spending so I’ll have about 4500 points — would buying a $67.50 uber gift card work to finish off before cancelling? Would buying a $75 GC work if I don’t have enough points for the full balance? It won’t let you do partial redemptions — you do need to have all the points. Does Uber still sell gift cards directly? If so that would probably work. They’re sold on the app but through Cashstar — Lyft also sells GCs. No DL PM status … yet. I enjoyed reading this post – you do so much analysis your decision is surprising but I think we all like the joy of free. In a different way I took advantage of the diversity of points this past weekend using the Amex business 35% pay with points to get a last minute one way flight, and with cash and a gift card I got with the Delta Amex credit to pay for the other one way. That type of diversification came in handy on a last minute change. I’ll add that if you have Samsung Pay you can pay at any terminal where you’d swipe your card, formal support not required! 4.5% on “mobile” payments becomes enormous then- I can pick up 4.5% on any dentist bill, mechanic fees, tires, basically any retail store, etc. Not hard to hit $3k+ in break-even spending. I have Samsung Pay and use it a lot with my Altitude Reserve. It was really great in Europe and worked just about everywhere. The State Farm insurance app just upgraded to accept apple pay with no fee. Between my 2 cars, my home, and my rental property, I have been raking in the points on a required bill that I would have otherwise only gotten 1x for. The real-time rewards is cool, and justifies keeping the card. But the Gogoinflight is what makes me excited about it. Esp for a trans-con, it’s just a great thing to have. (Of course someone like you might need it more than 12 times a year, but it’s just right for my family). Any confirmation on whether the travel credit counts towards the $4500? Personally, I’d never cut it that close on a minimum spending requirement. Even if someone tells you that it counts today, who knows when it could change? I never count on statement credits counting toward minimum spend. Yes it is still a benefit, but it only works with Gogo. I’m a big fan of this card. Also have Samsung Pay, which basically gives 4.5% for in-person and in-app transactions. Unfortunately Visa Checkout with Samsung Pay didn’t produce 3x. Realtime rewards is an easy way to cash the points out. I’ve got 5000 retention bonus, and kept the card. How long this card is gonna last? What do you think? I cashed about $1800 in a first year. How are you able to tell you are not getting 3x with Visa Checkout? Is there a quick way to check this, or do you manually audit every month when you get you statement and go through all your charges. I tried once, and only got 1x. This was with Samsung pay. Didn’t try with Google Pay. I get that, but my question is how did you know/confirm you only got 1x? Ok, thanks. Wish there was an easier way. so $75/$0.045 = $1666.66 spending per year via mobile pay to hit your effective annual fee not $3333.33.